Smarts SVGs are responsive, adjusting their level of detail depending on the size the are displayed at. Each icon is also composed of unique elements. You can target elements and groups of elements which share a property using CSS, allowing for some exciting customization opportunities. While Iconic may not be suitable for every application, the technology is impressive, and I’m looking forward to seeing it in use in the wild. 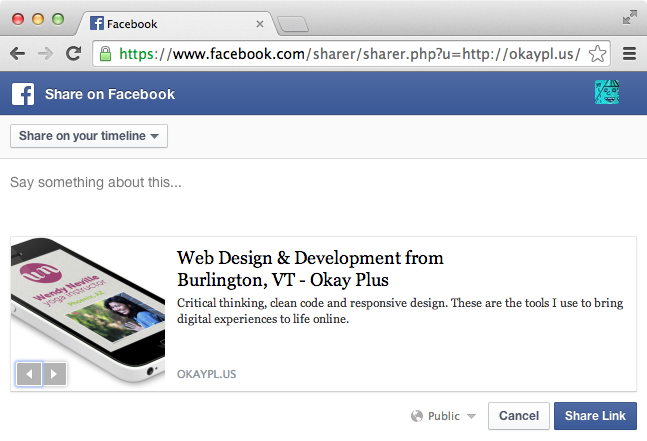 The Facebook share dialog is a service that Facebook provides which makes it easy to share links from a website on a user’s timeline. Essentially it is a webpage hosted by Facebook, which loads the link to be shared, and allows the user to add a comment before posting. The share dialog URL is: https://www.facebook.com/sharer/sharer.php. You can see in the screenshot above that the dialog pulls in the page title, description, and thumbnail image automatically. There are still many page online that describe how to use these additional parameters to customize the share dialog. However, earlier this year Facebook began ignoring all additional parameters beyond the URL to be shared. All of the shared content is now pulled from the page’s Open Graph tags. For instance if you want to change the title or description, you must edit the page’s og:title or og:description meta tags, respectively. If you are a developer, you should double check that your pages have proper Open Graph meta tags. For WordPress website, I highly recommend the WordPress SEO plugin, which will do the heavy lifting for you, while still allowing you to customize the tags on a per-page basis.